Blue has always been a little spooky over ground poles, and I’d more or less given up lunging her over conventional coloured poles as she got so agitated whenever she clipped one with a foot. Square poles that didn’t roll worked much better, but, even so, the slightest touch against a hind foot would send her shooting forwards. She seems to have a particular phobia for red poles, and tends to clear them with a huge leap. With this inside knowledge, I was interested to see how she’d cope with our next camp session, therapeutic polework. This type of polework is a great for stretching the horse’s back muscles, promoting accuracy, and helping to build the trust bond. It can be carried out equally successfully inhand or under saddle, making it suitable for horses who aren’t in full work. Our ride was split into two groups of three, most of us choosing to work our horses inhand after the rigours of the morning’s drill ride. For the first exercise, led by Debbie Robinson, the poles were laid out in a rough oblong. Debbie asked us to lead the horses right up to the pole, and have them stop just in front of it for a few seconds, before leading them over. Debbie asks her horse Jake to stop and stand before walking over the pole. Debbie Robinson in foregournd. This simple exercise phased several horses completely, as they were used to powering forwards over poles. After we’d all got the hang of that, we then asked our horses to walk over the pole then stop on the other side, rather than charge staight away afterwards. Finally, the horses were encouraged to step their front feet over the pole, then stop before moving their back feet. 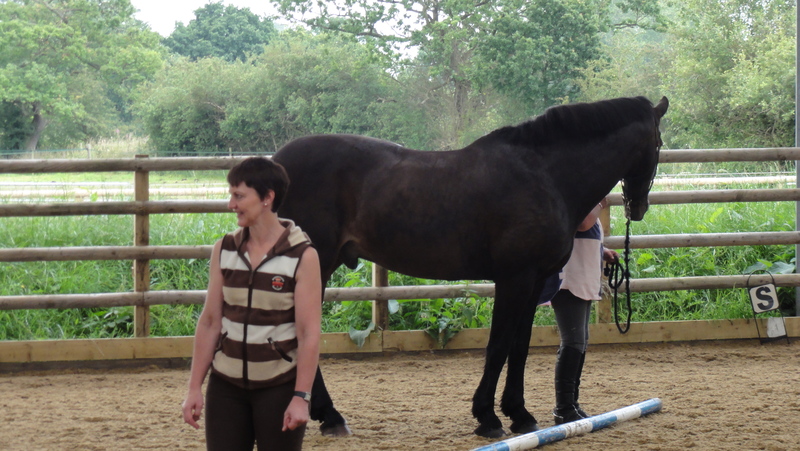 These exercises were designed to challenge the horses’ expectations, and get them really listening to us, as well as being useful for improving transitions. Rather to my surprise, Blue followed me happily over each pole, stopping and standing as directed, and not producing the expected four-foot-leap over the red poles. Mind you, we had just done a heavy session of drill riding. The groups then swapped over, and we moved onto the second exercise, led by Lisa Pritchard. For this, the poles were arranged into a rough circle. Lisa asked us to walk the horses round over the poles continuously, aiming for first the exact centre of each pole, then the outside end, then the inside end. The constantly changing instructions kept the horses alert and active, and they were soon stretching down and picking their feet up over the poles. Mel and Joss show off their footwork. 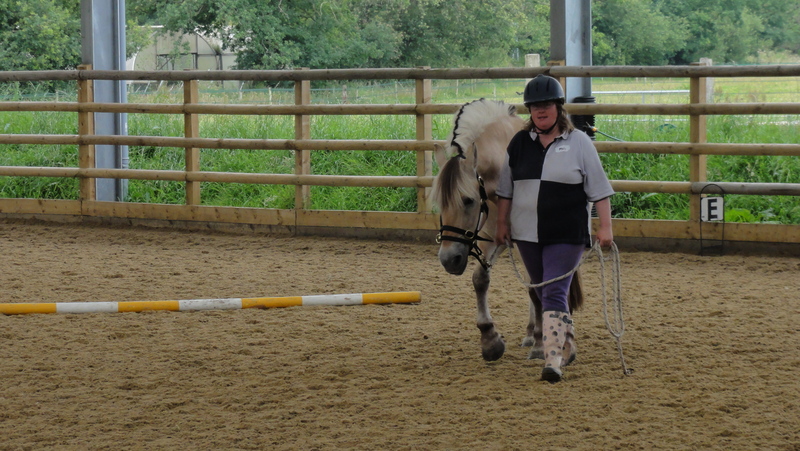 We then changed to weaving around the poles without touching them, before repeating all the exercises in trot. The more forward-going horses in the group were soon working calmly, alert for the next change of direction, while the stodgier horses were beginning to work more actively. One or two horses were even bending their hocks and lifting their legs properly from the shoulder, all in a half-hour session. This is something I’ll definitely be carrying on with, as it’s so quick and easy to set up. It also seems to have calmed Blue’s fear of round poles and bright colours, and hopefully practice will continue to make perfect.